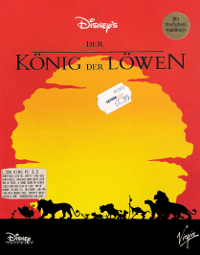 The game was released in December 8., 1994 on many different platforms, among others are: PC, NES, SNES, Amiga, Sega and Game Boy. 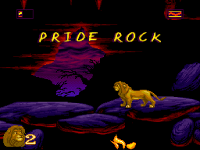 As common at these days, the graphics are based on sprites with an up-to-date graphics technique. However, now this seems way outdated, but it didn't spoil the fun. 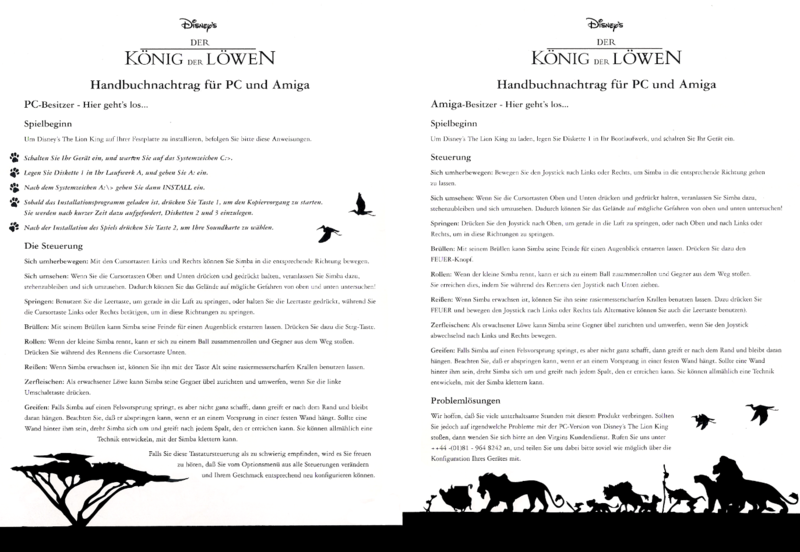 On the contrary, the graphics and backgrounds are created from Disney artists, who partly also participated at the movie. 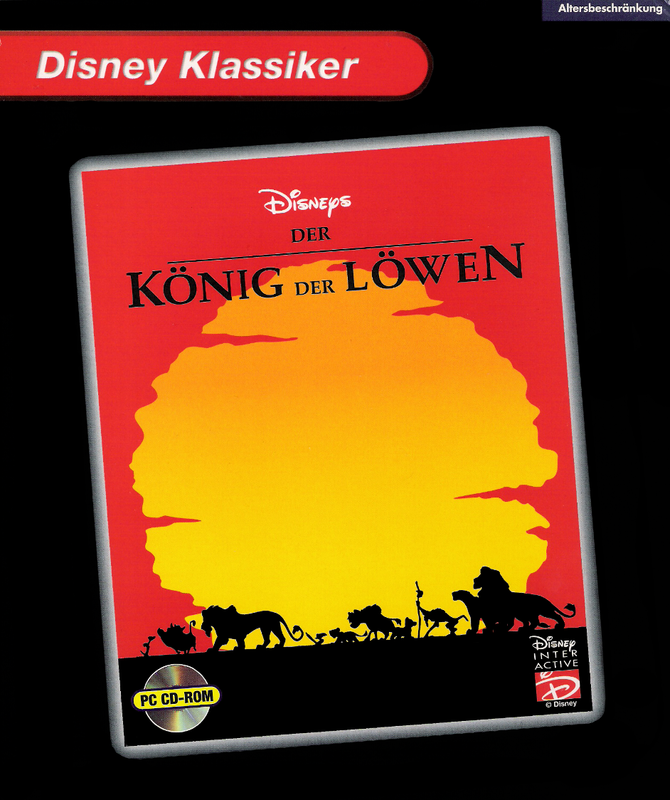 The soundtrack was adapted to the Midi interface and accompanies the different levels with the appropriate music, without voices of course. During the game you will notice on some platforms some favorite quotes from the movie for in-between sequences. The quality can differ much from platform to platform. Unfortunately there is no multiplayer at all in the game, neither network nor split screen. Nala as cub as well as adult is also missing completely in the game. 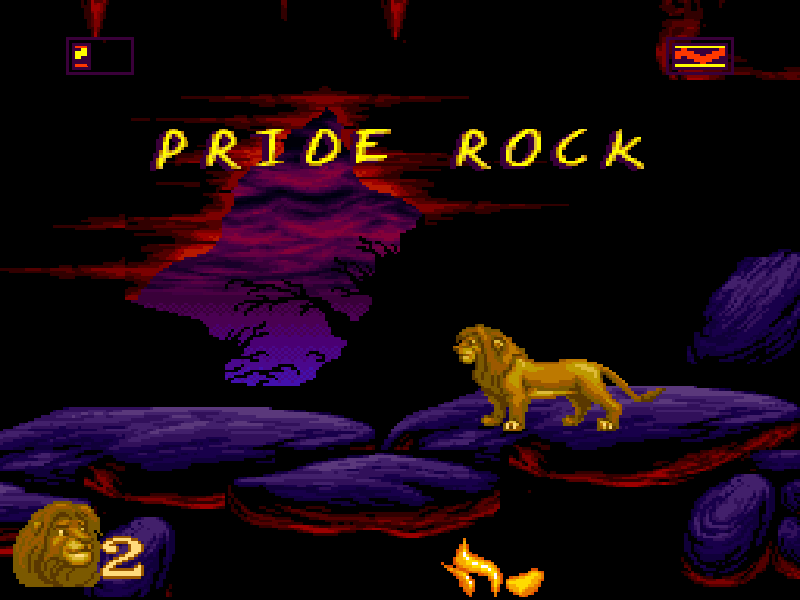 After the game started, a friendly and easy to understand game interface welcomes you, while in the background "Circle of Life" plays and Rafiki holds a lion cub in the air at Pride Rock. There are 3 different difficulties, which differ in strength of the opponents and the number of life at start. The difficulty can be set up in the options menu and on some platforms the key bindings can also be changed, as well as some additional tweaking for the music and FX sound effects. 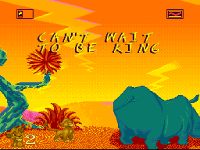 In total, the game has 10 levels and 2 bonus levels, which can appear many times, in case the conditions are met accordingly. Therefore a specific beetle has to be collected. Most of the functions of the game are self explaining, so there is a safe point in every level, where you can start after your death again. 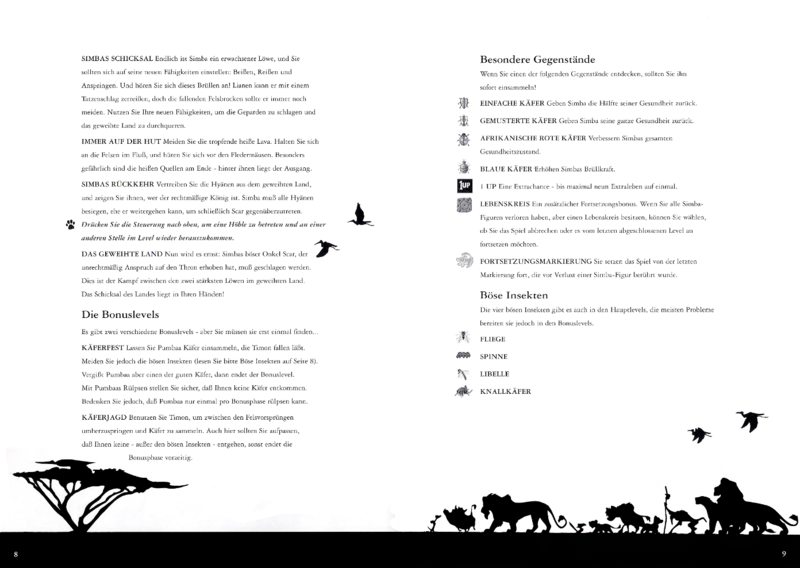 Collecting different beetles are for health and regenerate or increase roar energy. A sun, or "life circle" allows you to start at the beginning of the last level, in case all your lives are exhausted. 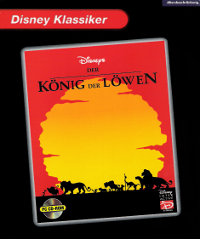 Real positive about "The Lion King" is the orientation on the storyline from the movie. 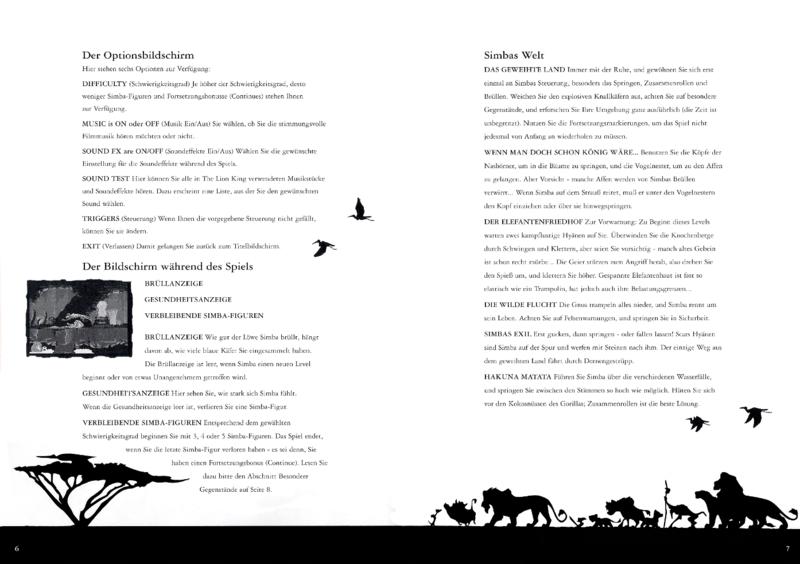 Each level enables the player to be part of a bit from the whole story in the corresponding setting. Generally, the aim of the game is to reach the end of the level, or beat a boss character. Thereby the player controls always Simba as cub, or respectively as adult. In the bonus levels Timon or Pumbaa is controlled. As usual the game consists of a HUD, which displays certain informations like the health and roar energy of Simba, which can be increased by collecting beetles. The number of remaining lives and life circles are also shown. 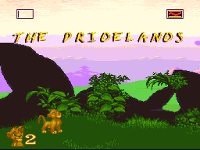 The first level starts with cub Simba in the Pride Lands, where the player can get familiarize with the controls and Simbas different skills. 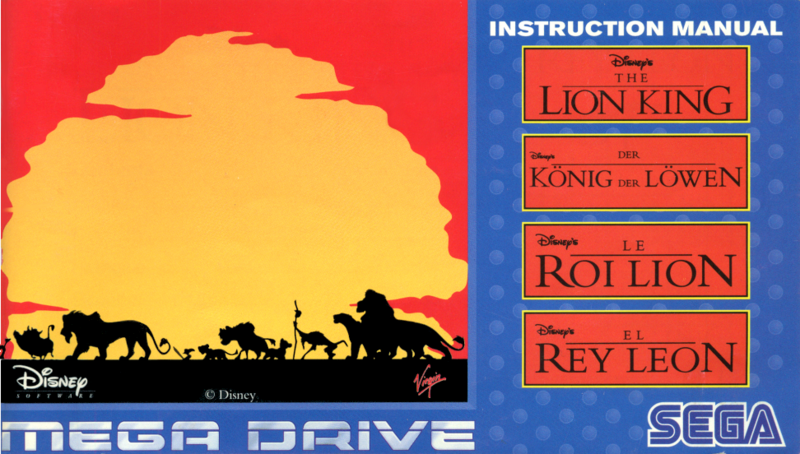 Beside run-, duck- and jumping, Simba can "roar" and "roll". With this abilities different kind of opponents can be eliminated. 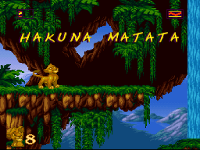 In the first level however, only small animals like hedgehogs and lizards are to be expected, which of course can also be dangerous to Simba. 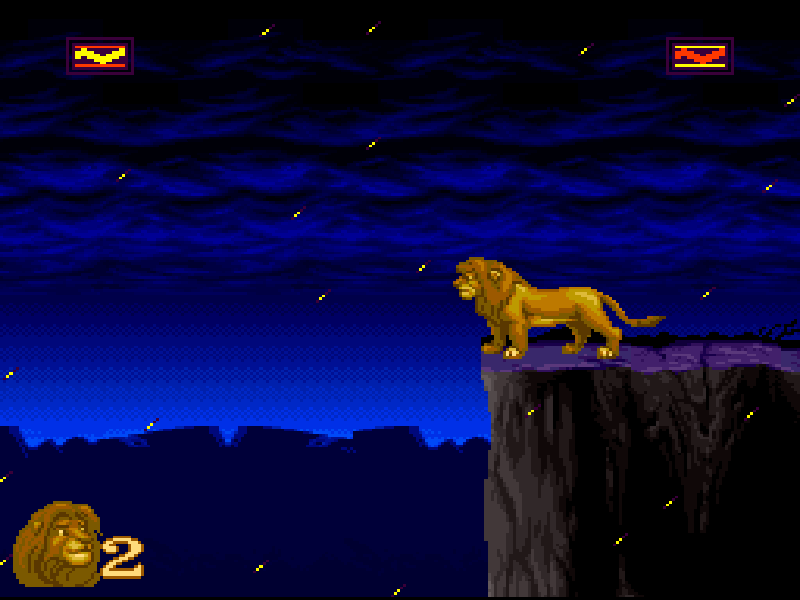 Meanwhile, Simba must go over rocks and trees to the top of the level, to finally oppose the boss, a hyena. It can be beaten by jumping on its back, while it is hackling for air. 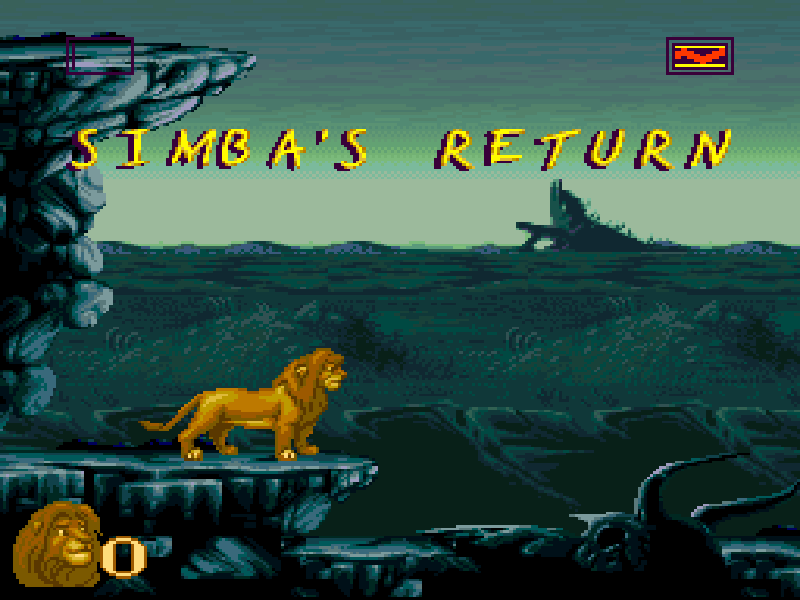 Arriving in the next level, Simba doesn't have to deal with bugs anymore, but instead he has to jump over giraffes heads, dealing with apes, ostriches and hippos. Thereby, he has to crack at two positions in the level some kind of code, in which order he has to roar the apes to be redirected into the right direction. The level ends unspectacular, when a certain point is reached. 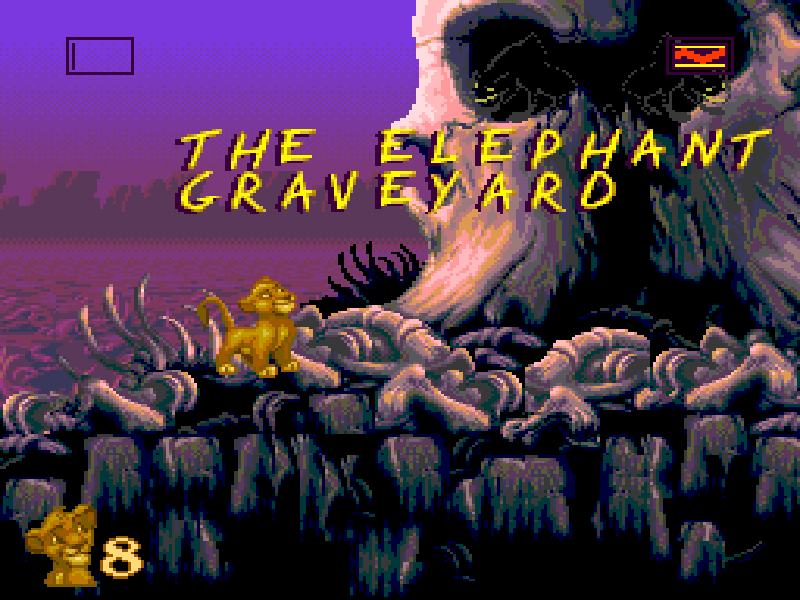 In level 3 the elephant graveyard is waiting for the player, which creates a very creepy atmosphere due to the rough landscape and the spooky "Be Prepared" medley. 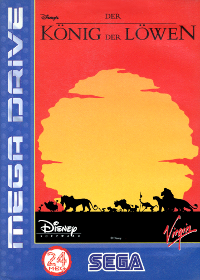 In most cases, the player has to get rid of angry hyenas and hungry vultures. 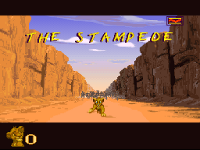 You should keep in mind the tip from the first level: do only attack the hyenas when they are hackling. The vultures need to be attacked fast, ideally before they fly off. Then it's more difficult to get rid of them, when they are flying. It is too late for that, then wait for their attack. At the lowest position try to jump on them. 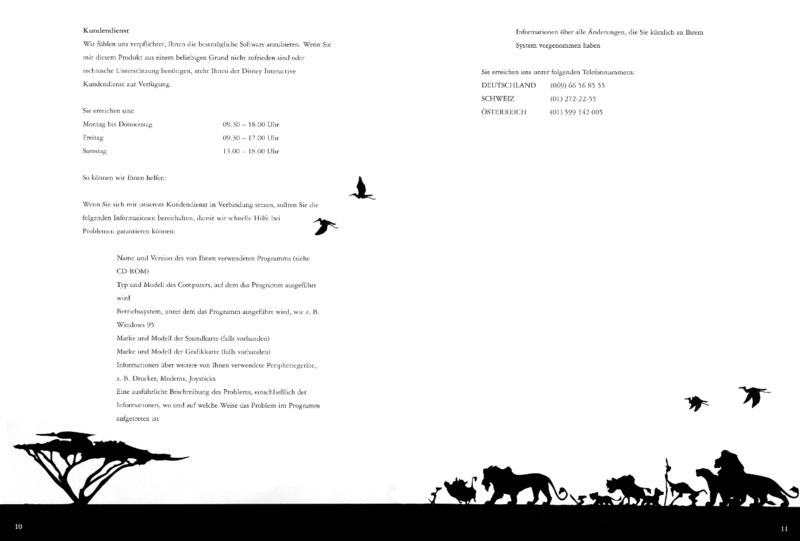 (Another tip: Observe the movements of the hyenas. In principle they ignore one special corner, where you can rest and start your counterattack. Likewise to the movie, the only goal here is to survive and ovoid the galloping horde. If the gnus are not enough here, during the level further difficulties are added, like fast appearing stones, which you should ovoid as well. 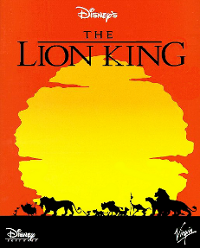 A difference to the movie is here, that unfortunately no Mufasa will jumps into the mass to save our little hero, but he has to save himself to the end of the canyon instead. At least every run of the level follows the same pattern, so after a few times you know what to expect when. It should be noted here that this level is also special from the point of view, because this is in contrast to all the others in some pseudo 3D. 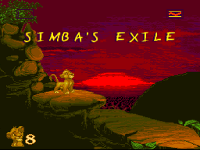 Now completely on his own, Simba has to escape through thorn bushes and the desert into his exile. 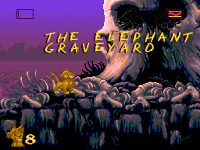 In this level, the same opponents appear like in the first levels, like hedgehogs and lizards. In addition, further complicated climbing parts has to be covered and rolling stones, which you should avoid, because after they hit you, you are immediately dead. And avoid the thorn bushes as well. Keep a lookout for hidden paths, which can lead to valuable beetles for health, condition, lives and even shortcuts through the level. In the end scene, the annoyed hyenas called their famous sentence "If you ever come back, we'll kill ya'". 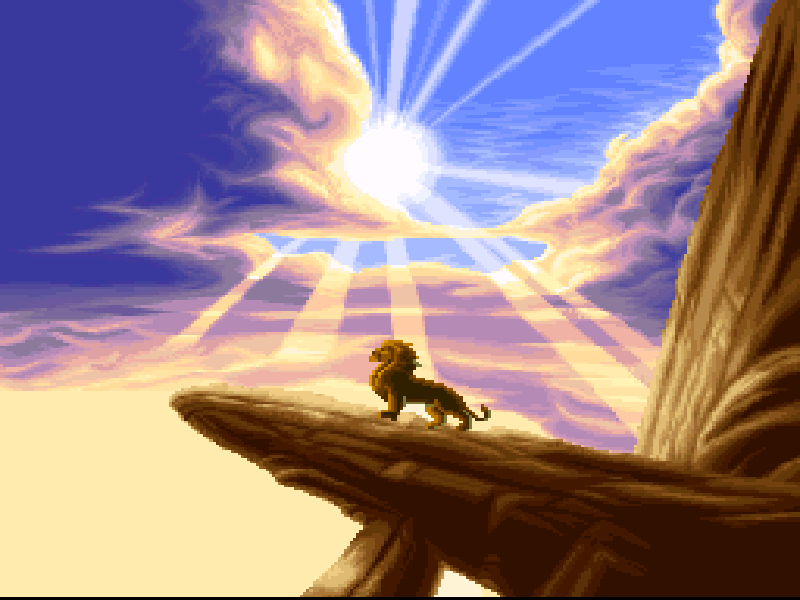 In the background the familiar medley of "Hakuna Matata" is played, meanwhile Simba needs to be lead to an endless landscape of waterfalls. But even in the problem-free paradise, you should be kept alert for jumping spiders and spitting frogs. In this level you also should keep a lookout for shortcuts, when you go down a waterfall. The direction you can control with the left, or right key. This can saves you some unpleasant parts of this levels. Before the end of this level you reach a very big waterfall with falling trees, which you should climb to get up. You should try to remain in the middle, and observe the velocity and size of the tree trunks. They all have a regular pattern. With a little patient and luck you are able to get up to the top tree. Now you finally thought the level was over, a very bad ape (no, not Rafiki) appeared before you, which must be defeated. 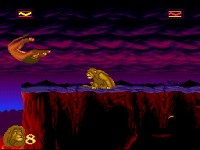 He is most vulnerable for jumping attacks, shortly after he smashes in King-Kong style on the ground. The end of this annoying ape is worth watching. 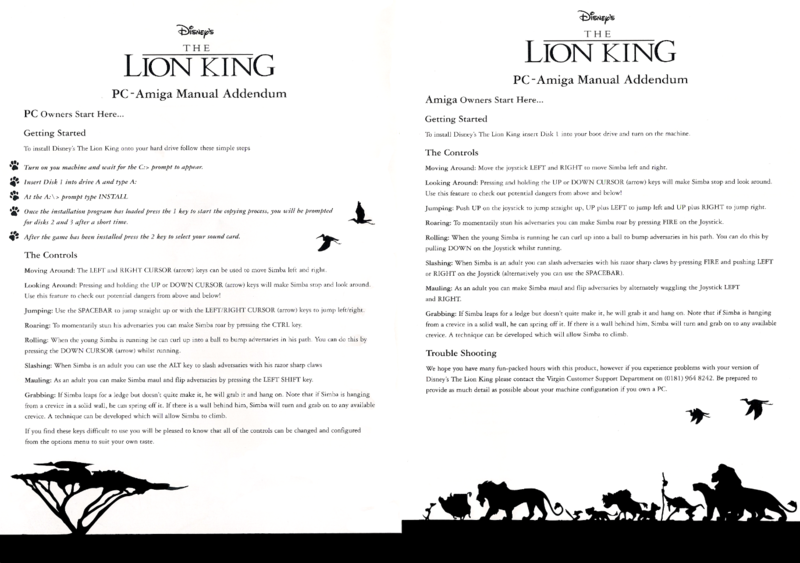 Finally grown-up, our lion has now additional skills. The rolling is gone now, but instead you can beat your enemies with slashing claws in two different modi and defeat this way, hyenas, leopards and apes. Moreover, two combo attacks are added to your repository, with one you can throw your enemy when they are hackling and a jumping claws slashing attack move. You should practice these one, especially the throw move, although it is not needed for the next few levels, but you'll need it in the end. 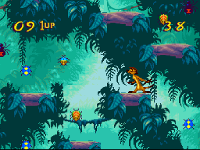 Now back to this level: Simba has to pass here the jungle and has to deal with leopards, stone throwing apes and some other natural obstacles, which blocks his way. But this is no problem for a fully grown lion now. At the end, Mufasa appears and tells him that he has to take his rightful place as king. Because Nala is missing in the whole game, there is of course no "Can You Feel the Love Tonight" scene. Never mind the questions how to implement it. The most unpleasant part of the game comes now, although "Be prepared" is more at the beginning of the movie, in this case it is more a hint to the setting of this level and not Scars song. Simba has to go through it anyway. Acid dropping cave walls, which you should avoid of course, Hyenas and flying bats, which can only be beaten with precisely aimed hits and roars, are only a few of the negative highlights of this level. 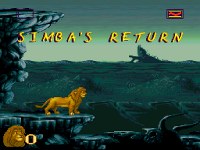 Meanwhile Simba has to pass lava spitting geysers, which erupt in regularly patterns and rolling or falling stones, which can be useful at some points to free blocked ways. In the end of this level you should exploit these to close the geysers, but don't let them hit you! The final battle with Scar is now about to begin. But even when you think you have won, Scar escapes and you are forced to follow him, which is of course not as easy as you might have thought. 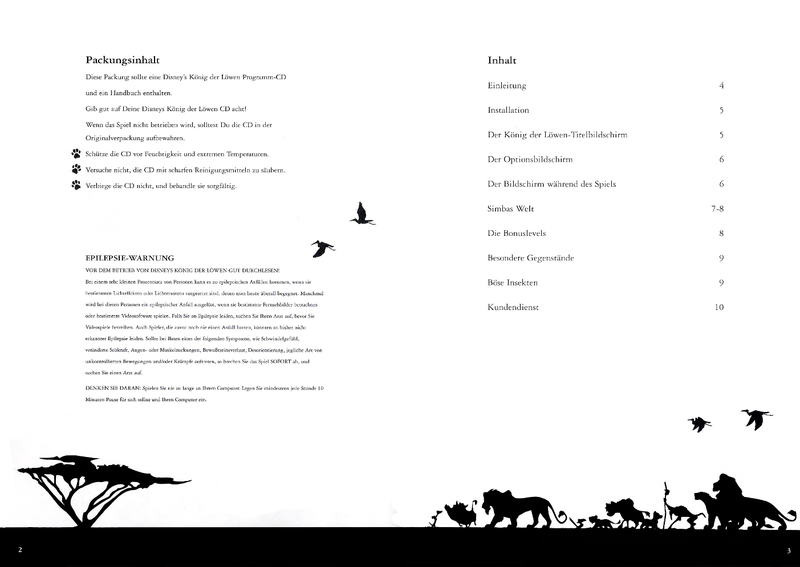 Hyenas and natural barriers like cliffs and rocks are blocking the way. After passing these, the second encounter with Scar follows, where he can escape after taking some heavy beating again. Finally arrived at the top of Pride Rock the real final battle begin. 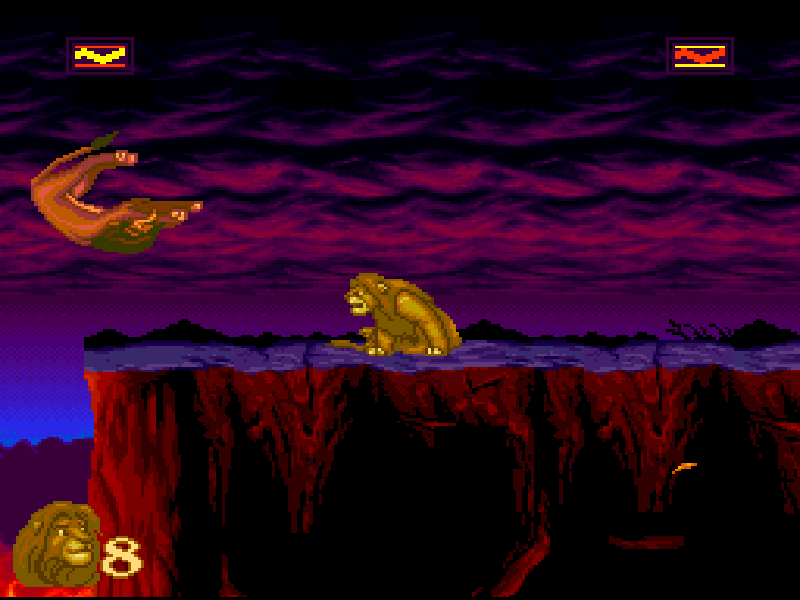 Scar tries to use his claws or a jumping attack, in case you are going towards him too fast. Beside that he can beat you with his paws like Simba, but in addition he also has a defending move, which blocks your claw attacks. Scar is also able to jump at you and press you to the ground. You should definitely avoid this one, because after such an attack you are most likely dead. Effective against Scar is to keep him on distance and use the jump attack of Simba. Unfortunately Scar doesn't have a health indicator, which could show you his status. However if Scars begin to heavily hackling, then he is almost finished off, but not beaten yet. In order to do this, you have to throw him over the cliff, likewise to the movie. The best strategy is to drive him to the corner of the cliff, then jump over him and use the throw combo. Afterwards you can finally take your rightful place as king. 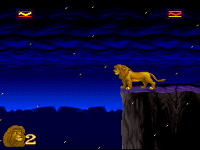 End Sequence: Simba throws Scar over the cliff. 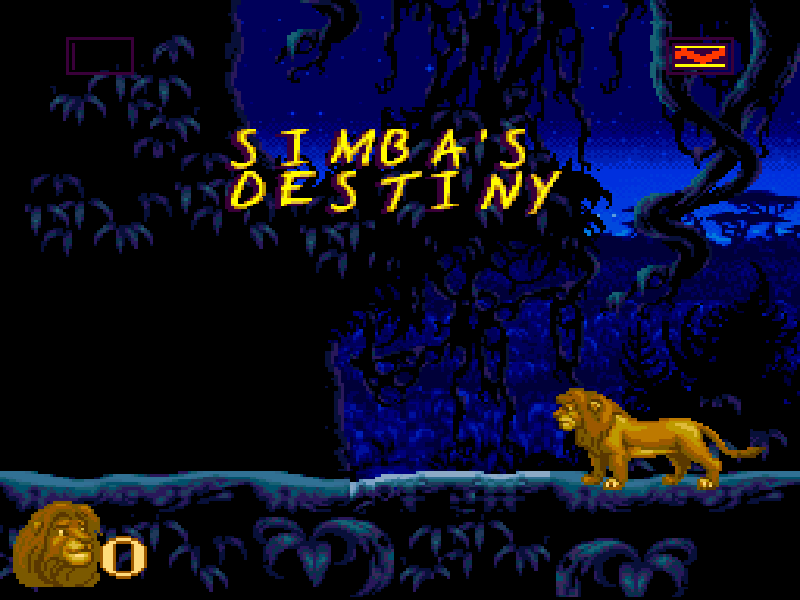 ...and Simba takes his rightful place as king. 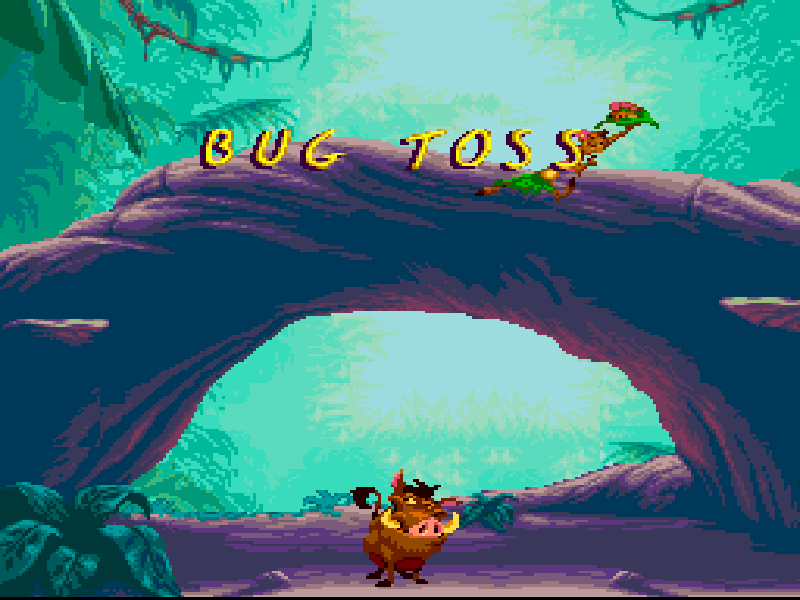 In the first bonus level, Timon are standing on a tree trunk and throwing beetle, lives and life circles down to his companion Pumbaa, who has to try to get/eat them. If you miss one, the level is over. Thereby the velocity of the beetles and numbers of them are increasing with the game time. But be careful, Timon is not always throwing good things, but also spiders and that sort of things, which should be avoided. Of course, you keep the lives and life circles you get after the bonus level. 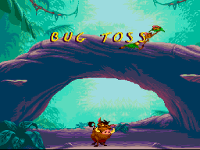 In order to get to the bonus level, you must collect a special beetle, which is mostly hidden in the different levels. 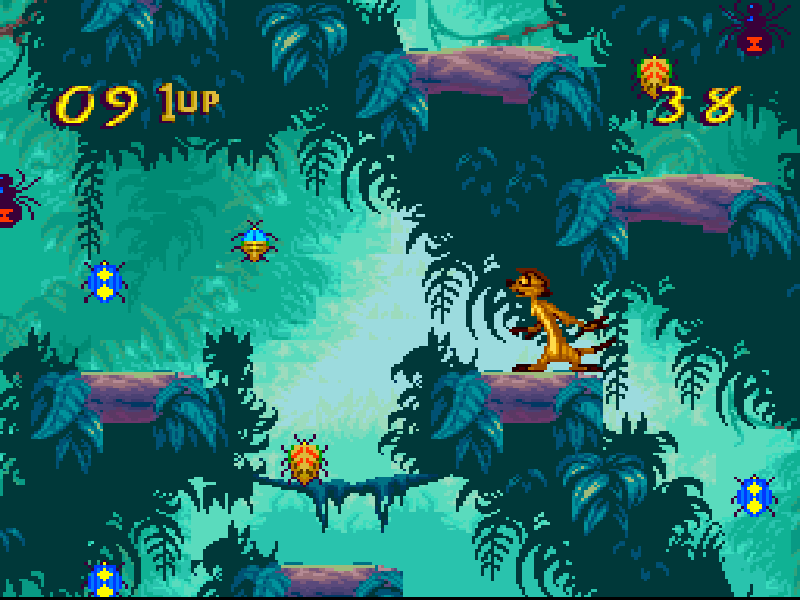 Here you are controlling Timon now, who has to hunt beetles now. Thereby he is running through the level and must try to collect as much as possible within 30 seconds. After every 10 beetles you get either an extra life or a life circle as long as the time is running or you don't accidentally get a spider. 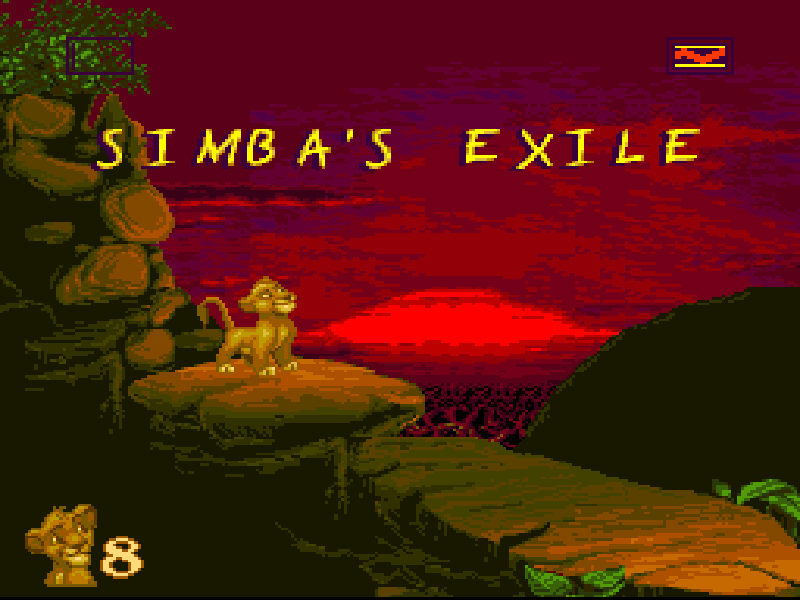 The total number of lives Simba can have is limited to 10, though. Although the game is developed for different platforms at the same time, the versions can differ much from each other. In most of the cases, this can be traced back to the difference in architecture and their limitations. 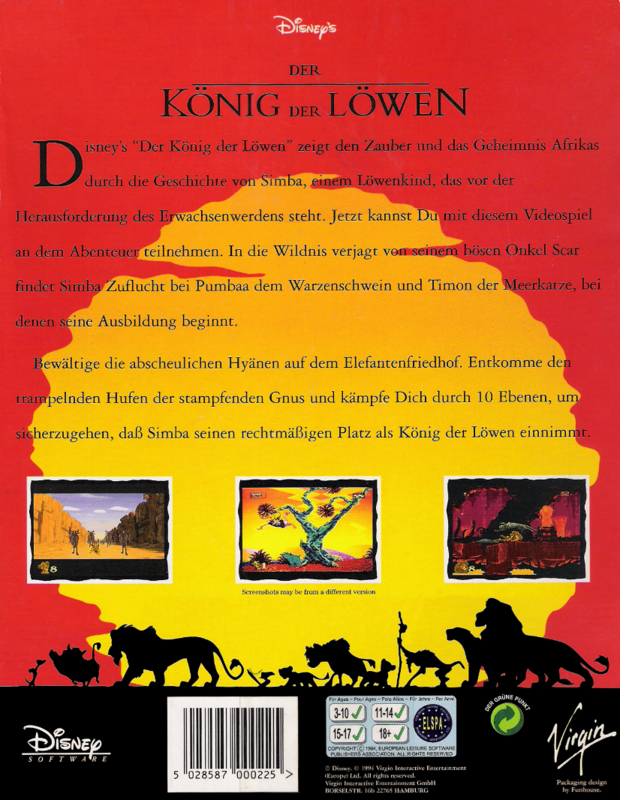 For instance, the Amiga version lacks a few levels, so that the game fits on three 880kb DD-Discs. The sound and the effects are limited by the sound cards of each system, whereas the DOS and SNES Version have the best music quality and the best sound effects. 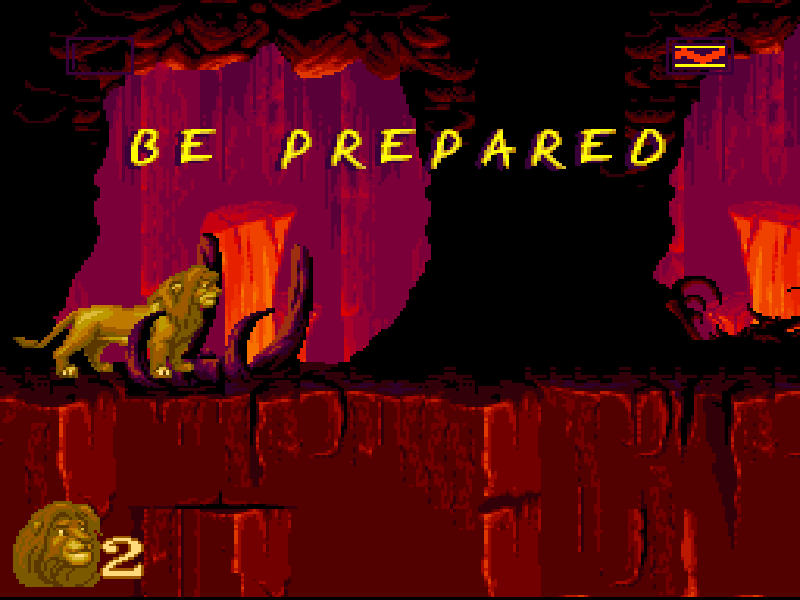 In the DOS versions it depends on your sound card. With a good sound card it can outdo all other systems. 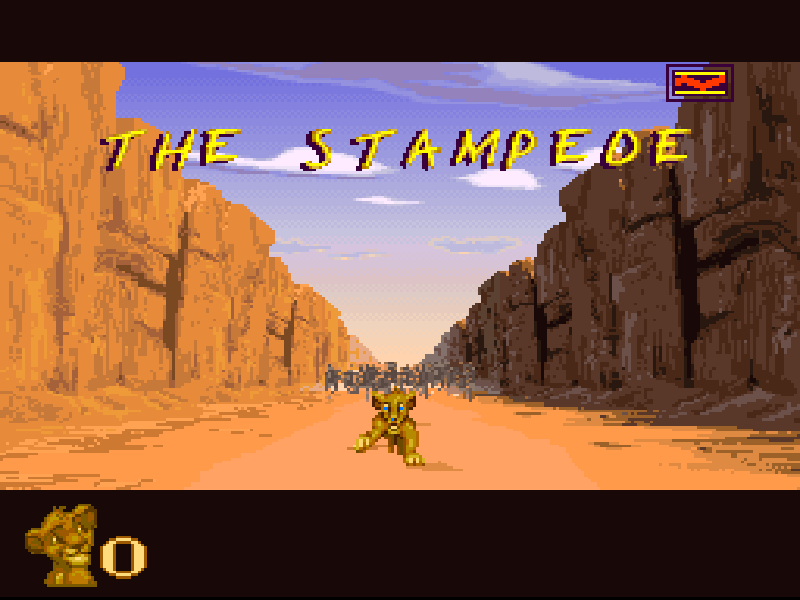 The graphics is most convincing on the SNES version, because they don't have to rely on dithering effects. 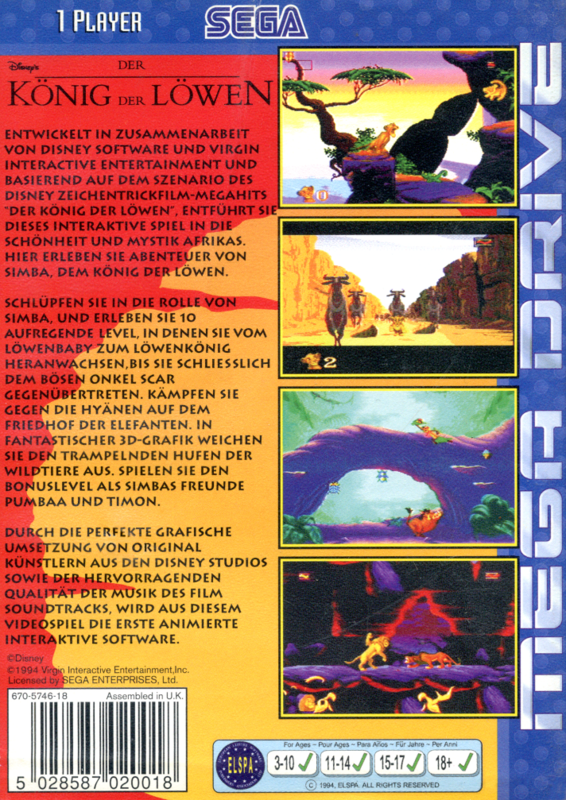 A very detailed comparison between Mega Drive, SNES and Amiga can be found here. There are also differences within the levels on the different platforms, for example in the SNES versions some bugs were fixed and it seems to be more simpler in this particular version than e.g. compared to the DOS. One of these mistakes, which happens very often in the DOS version is, during the ostrich run in "Just Can't Wait to be King" is that the ostrich runs in the middle of the screen instead of the left corner, which limits your reaction time. Also the sound effects differs lightly. However, the last level are designed to be more difficult with fire igniting at the SNES. Because the game is released on so many different platforms, I try here to collect some scans of the different covers and handbooks. 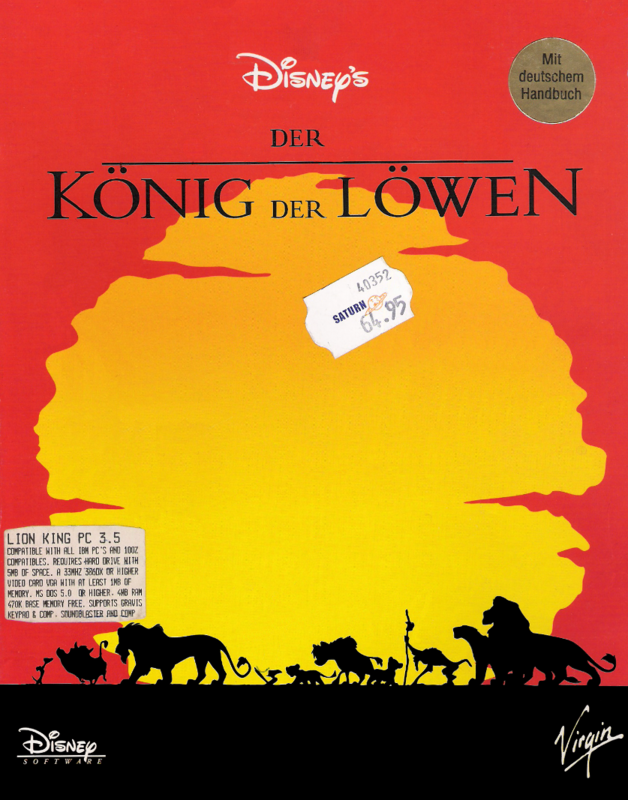 Cover of the DOS version. Unfortunate it is quite old and used. 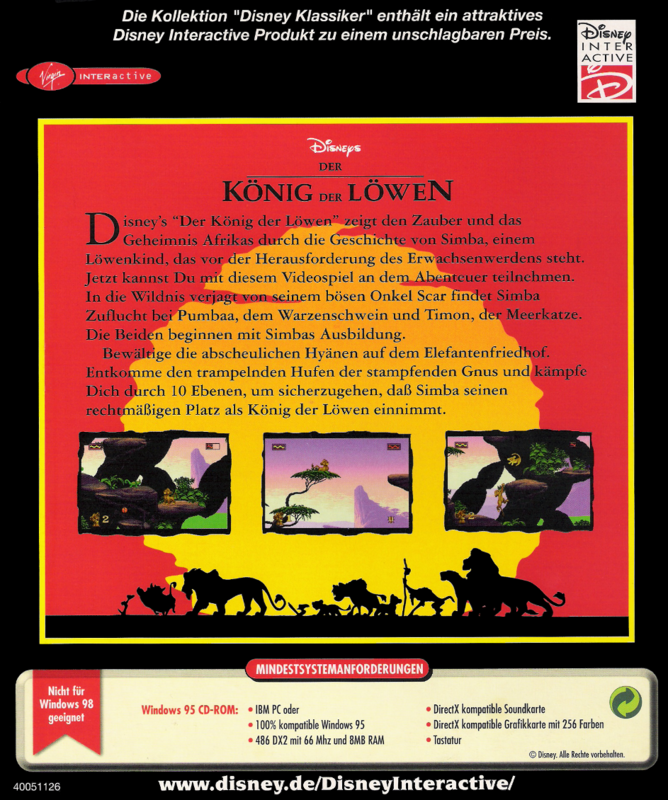 Backside of the DOS version. 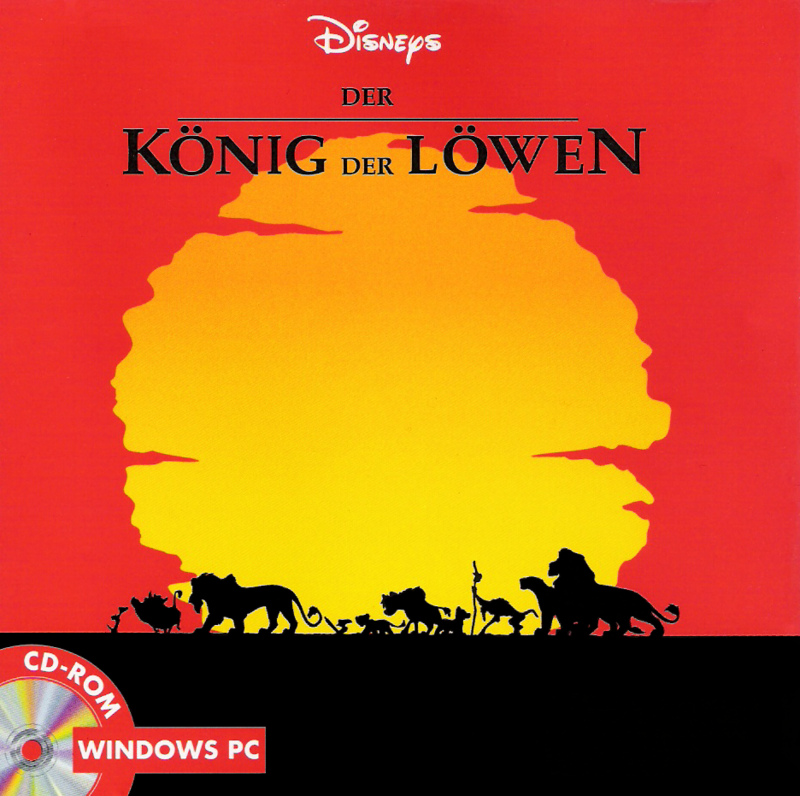 Cover of the Windows CD version. 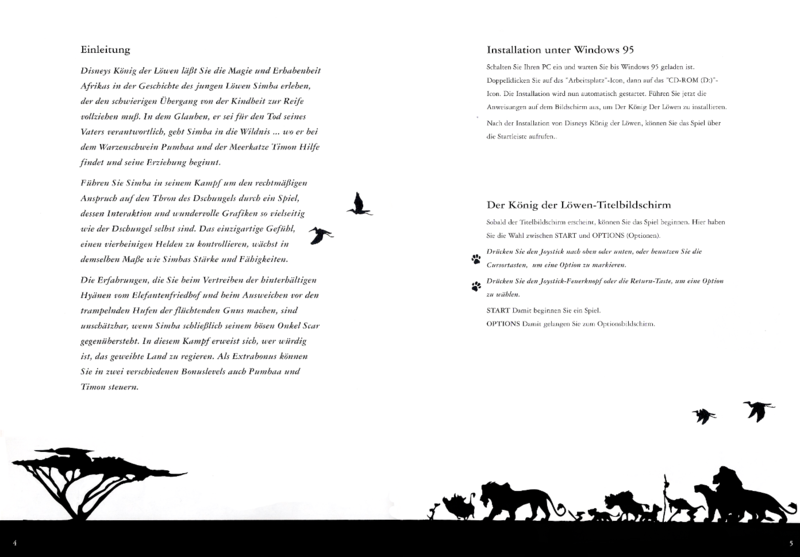 Backside of the Windows CD version. CD Cover of the Windows CD version. Cover of the Sega Mega Drive box. Backside of the Sega Mega Drive box. Multilanguage handbook from the Sega box. You can't expect much variation of the game, but the backgrounds and the animation of the figures are very lovely. Moreover, it is nice to see a game which actually follows the storyline of its movie, although not all characters appears in it. From an objective point of view, the graphic is really outdated, but on the other hand 1994 the graphic was very good and I grow up with it, so at least I still like to play the game. In case you want to play the game, there are many possibilities, so you can look for ROMs or the DOS version and use dosbox, or an emulator for SNES, which should be the most preferable solution. With an good emulator you can even increase the gaming experience with additional built-in post-processing like anti-aliasing.